Equifax Dethroned! | LOFTY CREDIT! Now there’s a verifiable way to eliminate those pesky negative reporting items from your credit report published by Equifax, one of the three major credit reporting bureaus. It’s simple, when you employ our powerful and proven “Equifax Dethroned” process the desired results are achieved within only 35 business days. What exactly are the “desired results achieved” you ask? Glad you asked. The majority of negative tradelines will be removed and in many cases ALL negative tradelines are removed! But that’s not all… We also target those hard to remove Inquiries, Public Record items, and Collections being reported (public record items include: tax liens, garnishments, judgments, child support, foreclosure, school loans etc). Now there’s no more need to “dispute” items being reported adversely affecting your credit profile when engaging battle with this particular formidable foe because we wipe your slate (Equifax Only). Our process leaves all positive tradelines on the report, which means your score increases and elevates to the highest heights! You can also combine our time-tested “Master Clean” credit restoration process by hiring us to engage the other two bureaus effectively (see below for pricing details)! 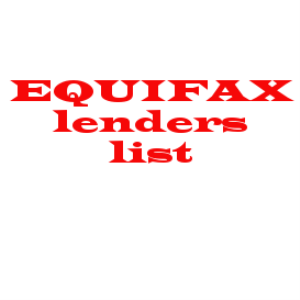 *BONUS*: When you order our Equifax Dethroned process now you will receive our special comprehensive report listing all lenders and credit providers who solely use Equifax as their source for credit determination of their applicants. This is extremely powerful information to have because once we’ve deployed the “Equifax Dethroned” process for you, it gives you a huge advantage of being able to target those specific credit providers to obtain funding or credit as needed.